Clyde boss Barry Ferguson has rung the changes in an attempt to secure a long-awaited promotion for the Broadwood outfit. The curtain had only just come down on Clyde’s campaign when the Bully Wee began to draft in the first of a raft of new faces. 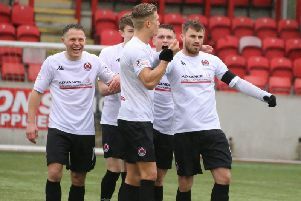 Within a week of their play-off defeat at the hands of Queen’s Park the manager had secured the services of Annan Athletic midfielder Matty Flynn and defender Martin McNiff, Berwick Rangers defender Ewan McNeil, Arbroath full-back Jordan Lowdon and Stirling Albion midfielder Phil Johnston. More followed. Highly rated midfielder Dylan Easton arrived from Elgin City and former Clyde defender Michael Oliver returned to the club after impressing for Cumbernauld Colts last season. Experienced striker Peter MacDonald was also brought on board after being released by Morton and teenagers Robbie Davidson, Michael McGinty and Kyle Ferguson were also added to the first team squad. After six years in the bottom tier of Scottish football a return back up the divisions is long overdue for a club with Clyde’s history and tradition. And Oliver says the players have been left in no doubt their target for the season is a simple one - to win the league and if possible avoid the complications of another play-off. He said: “Clyde almost got to the Premier League a few years ago but things have slipped since and they’ve gone down the divisions. “But the manager has spoken to us and made that clear to us that winning the league is the aim. “I think the most important thing is to try and be consistent. “It’s obviously important to get off to good start and if you can get some wins in your first five or six games then that gives you an early edge and hopefully you can maintain consistency. During Clyde’s pre-season and Betfred Cup matches Easton in particular has caught the eye and Ferguson has high hopes for his new midfield playmaker. He told the club website: “When I found out that there was a chance we could bring Dylan to Clyde, I started working on the deal straight away and we worked extremely hard to get him. “When we met initially, he was so keen to do something with us and that was the thing that really got me - he wanted to play for me and for Clyde. “He’s got undoubted quality and he is a link between the midfield and forwards, something that we know we have been missing. He’ll fit perfectly into the way we’re going to play next season, with a younger team and lots of energy all over the pitch. MacDonald too is likely to be a key player, given the 35-year-old former Rangers, St Johnstone, Dundee and Morton player’s record in scoring goals at the top level of Scottish football. Ferguson said: “I think we’re getting everything with Peaso. He’s played and scored goals at the highest level in Scotland and not only that, he’s a good character and a good man to have in the dressing room. “I’ve known him for a long time, since he was a youngster at Rangers and I’ve kept in contact with him over the years. When he became available I couldn’t pass up on the chance to bring someone of his quality to the club. “From our first conversation about coming to Clyde, his hunger and desire really shone through. Last season was a bit of a non-event for him at Morton for various reasons, but he is now so enthusiastic about coming to Clyde and fighting for his place in the team.